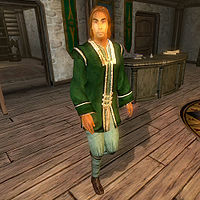 Volanaro, an Altmer nightblade, is an Evoker of the Mages Guild who offers Recharging services and sells spells at the Bruma Guild Hall. Similarly to Borissean, Volanaro sells a wide range of spells from every magical school, although few of his are master level. This makes him an ideal spell-vendor for mage type-characters without access to the Arcane University. Along with J'skar, he enjoys playing pranks on Jeanne Frasoric, the local guild head. Their latest is making J'skar invisible and having him hide around the guild building. In the Bruma Recommendation quest, you may strike a bargain with Volanaro to make J'skar appear again. He seems to have little to accomplish in life apart from his pranks, since he spends most of his days wandering. He sleeps from 1am until 9am, and eats his only meal of the day from 6pm to 8pm. He spends the rest of his days walking around with no particular destination in mind, although there is a 50% chance that he'll mix up potions with his Mortar & Pestle from 8pm until 1am. Though his strolls may occasionally lead him out of the Bruma Mages Guild Basement, he never travels far. The only change to this schedule is during the related quest: until J'skar is visible he will travel to a basement room at 10pm, staying there until midnight, to dispel his friend in front of you. Like most of the Bruma chapter, he is killed when the hall is attacked by Necromancers during the Plot Revealed quest. He has 15 gold and a Mercantile skill of 6, which means you can drive a hard bargain with him while buying his spells. Before the Recommendation quest, he will be available when not eating or sleeping. During the quest he won't offer his services while on his four-hour trip to the basement. Make sure to buy any spells that you want before he dies, particularly the Summon Dremora Lord spell which cannot be found anywhere else in the game without purchasing the Spell Tomes official plug-in. He wears upper-class attire consisting of a green brocade doublet, green silk garment and a pair of green velvet shoes. He also carries his Mortar & Pestle, a Mages Guild Key and a sizable amount of gold. He doesn't carry any weapons, relying instead on a series of medium-level spells from all of the magical schools; these are also the same spells that he will sell you. When you approach him for the first time, he will reveal both his specialties and his sense of humor: "Volanaro, at your service. Need a spell? Need an item recharged? Need a witty practical joke played on someone? I can handle it all." If you are not in the Mages Guild he will advise: "If you're looking to join the guild, talk to Jeanne Frasoric. If nothing else, it means access to better services than most people enjoy." He doesn't like Bruma too much: "It's a little too rugged up here for me. Add a couple hairs to a Nord and you've got a bear." As he himself plays pranks regularly, along with J'skar, he finds it a pity Selena Orania doesn't participate: "It's a shame that Selena doesn't join in our fun, but she takes her role as an Alchemist very seriously. If you need supplies, she's the one to see." On the topic of Jeanne he will say: "With all due respect to our wonderful leader... She couldn't cast her way out of a paper sack. It's insulting that we're here, working for her, when she knows nothing. She's managed to butter up the right people just enough to keep her position, and there's little we can do about it. But we have our ways of coping with the situation." His prankster reputation is widespread, as Selena Orania will mention: "Volanaro has a twisted sense of humor, but he also has a few nice spells up his sleeve. If you want to summon a Bound sword, talk to him." Asking about J'skar to fellow guild members they will point you towards him. Jeanne naively says: "No one here has seen him in days. Volanaro thinks maybe a spell backfired." Selena is more in the know but isn't exactly excited about it: "Volanaro said something about a spell backfiring, making him permanently invisible. Maybe you should go see him about it. I don't feel like talking about it with you." and "Look, I like you and all, but I really don't want to get in the middle of this. If Volanaro and J'skar want to have their fun, fine. I'm not going to participate, and I'm not saying another word about it. Take it up with them." When on business collecting the recommendation, if his disposition towards you is below 70 he will deceive you about J'skar: "Hmm? Oh, Jeanne has you looking for him, does she? I'm afraid you're not going to find him easily. I think a, uh, spell backfired. That's probably it." Once you have persuaded him to talk he will be excited: "You want to find J'skar? All right, I think I can help with that. But you have to agree to do something for me, first. And whatever you do, you can't tell Jeanne about it. All right?" If you choose to decline his offer he will unhappily reply: "Fine. Your loss though, isn't it? Can't get that recommendation you need." If you wish to reconsider he will respond: "I've already told you, I'm not helping unless you agree to do something for me. Do we have a deal, or not?" If you agree to the deal he will be delighted: "That's the spirit! You help me pull off a little prank, and I'll help you find J'skar." If you pursue him about the prank he will instruct you: "Heh. Really, you're going to love this. I'll teach you a spell to unlock things. What you need to do is get into Jeanne's desk, and bring me her Manual of Spellcraft, okay? Her room is upstairs; make sure no one sees you. You do that for me, and I'll make sure you can find J'skar." He will then teach you the apprentice level spell Minor Latch Crack. If pursued about J'skar he will reply: "Bring me Jeanne's Manual of Spellcraft, and then we'll talk about helping you find J'skar." When further discussing the prank he will say: "Just go unlock Jeanne's desk with that spell I taught you.. Find her Manual of Spellcraft, and bring it here to me. Her room should be easy to find. It's the only one upstairs that has a door. Just one more privilege she doesn't deserve." Once you have pulled the prank and brought the manual to Volanaro he will be satisfied: "You've got Jeanne's book, I see. All right, then. I'll just take that from you.... Meet me here in the living quarters just after 10 PM." If you continue to speak with Volanaro he will be amused about Jeanne: "She won't figure this out for weeks! Ah, it's times like this I enjoy what I do." He will continue his amusement if asked about the prank: "It was a good idea, wasn't it? I wonder how long she'll spend trying to figure out where she put it down." When it reaches 10pm, Volanaro will be waiting. When you speak to him he will say: "Ready to find J'skar?" He will then tell you "Just watch. You'll see." He will proceed to cast a dispel spell at J'skar who will appear. If you chose to perform the task without the help of Volanaro, he will be quite bitter once you have found J'skar: "Yes, yes. You're quite the sleuth, finding him all by yourself. Jeanne will be so proud, I'm sure." During A Plot Revealed, J'skar will sadly recall Volanaro's death by the hands of Mannimarco and how their prank saved his own life: "I couldn't believe my eyes. I think the only reason I'm alive is because I was invisible... but even so, I think he saw me. He killed them, one by one. Volanaro was last, I think. He was trying to run away, but he didn't make it, did he? The King of Worms stood over him, right before he died, and he... well, it looked like he sucked out Volanaro's soul!" The only official way to get it is via the Spell Tomes plug-in, where it will appear in random loot as a tome. Otherwise, you can use the Console and type player.addspell 0003C413. An Altmer Nightblade called Volanaro also exists in Morrowind as one of the guards of the Glass mine Dunirai Caverns, in Vvardenfell. He is the victim of a Scripted Death, but is not flagged as an essential NPC after the Bruma Recommendation is complete. Thus it is possible for him to effectively "die twice". This page was last modified on 7 December 2016, at 04:55.